Read more >> X If you are going to be painting several children, have them sit on high stools, preferably with backs. A proper working posture prevents back complaints. 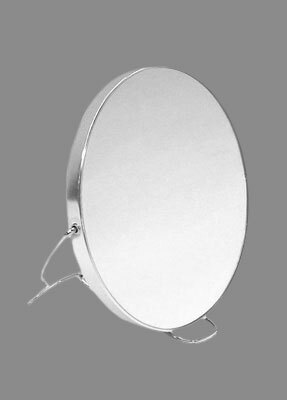 Hint: children like to be able to watch their face being painted in the mirror. This will generally ensure they are less easily distracted and are more likely to sit still. 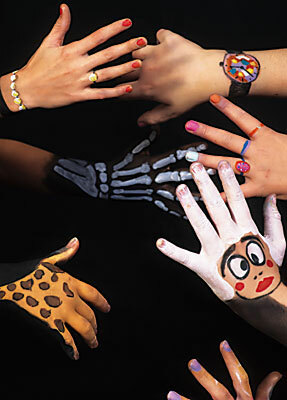 Read more >> X If children have skin irritation or small cuts on their faces, you can also do the painting on the hand. If the skin is dry or sensitive, than apply a thin layer of Grimas Under Make-up Base: a non-greasy cream with a caring effect. Let the skin absorb it for a few minutes before you start working on the skin with Cake or Water Make-up, thus ensuring that the product has been fully absorbed into the skin. 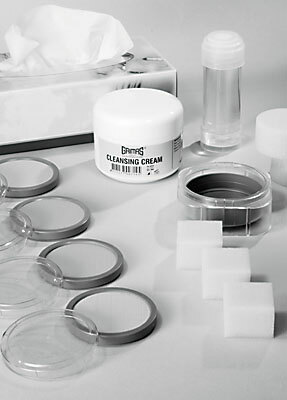 You can apply Grimas Water Make-up (Pure) directly to the skin, but you may also choose to apply a layer of Grimas Cake Make-Up first. This offers the advantage that the colours of the Water Make-Up colours are more even and more intense (especially the lighter tints and silver) and that in addition, these colours can be removed more easily from the skin later on. 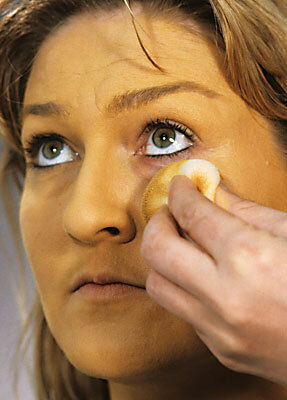 Read more >> X You apply Cake Make-up with a slightly damp make-up sponge. If you work with too much moisture, streaks will form. 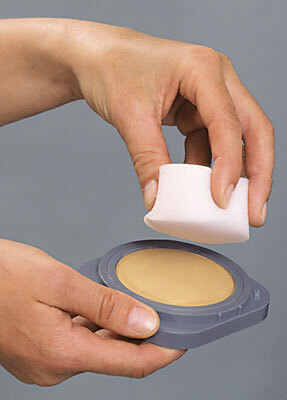 You can press the make-up sponge down onto a tissue to remove any excess moisture. Read more >> X First dab a little Cake Make-up onto the hand to check the colour intensity. Then apply it evenly from top to bottom. Work from light to dark, if using more than one colour, and apply the Cake Make-Up right up into the hairline (do not forget the ears and the neck); this is how you avoid a mask-like effect. Cake Make-up dries quickly, so you need to work quickly to achieve a nice result. 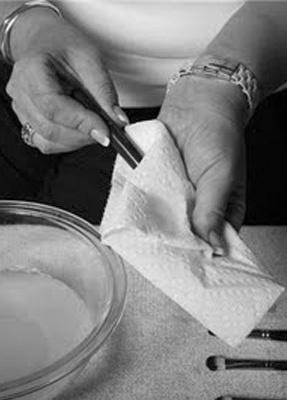 If the result is not even, turn the sponge that you worked with over and use the clean side to even out the make-up. Any stripes after drying can be gently rubbed away with a soft tissue or cloth. Read more >> X Water Make-up dries quickly, so you need to work quickly to achieve a beautiful result. Don't work too dry, but do not use too much water. If you do not want the colours to mix, be sure to wait for the first layer to dry before applying another colour over it or up against it. Read more >> X The shape, width and quality of the brush are to a great extent qualifying the effect you can achieve with it. For instance, round brushes are ideal for making curves and drawing curls. You draw straight lines preferably with a flat brush, keeping the handle of the brush pointed in the direction of the line. The more quickly you draw the line the straighter it will be, and the more pressure you apply on the brush, the thicker the line becomes. To draw a thin line, you do not necessarily need to use a narrow brush. You can also use the edge of a flat brush for that. This brush is also very convenient for making a thick line merge into a thin one, turning the brush on its side in one fluid action as you go automatically changes the line from thick to thinner. 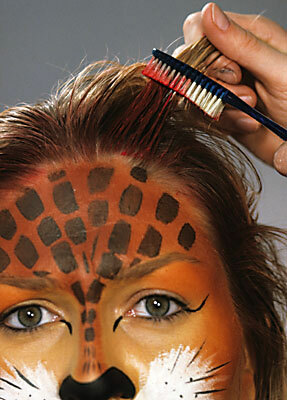 When you come to the end of a line, lift the brush from the skin in a single smooth movement. Read more >> X Hint: to make beautiful, thin lines, you mix the Water Make-up with Cleansing Lotion instead of water. Read more >> X Water Make-up works just like watercolour paint. The best way to apply Grimas Water Make-up (Pure) and Water Make-up Pearl Pure is to use a brush. 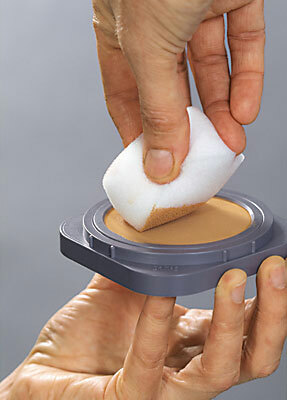 Use the brush and a little water to soften the make-up and make it a bit pasty. Test the colour intensity on the hand. Don't work too dry, but do not use too much water. Colour the entire tip of the nose and nostrils with a dark colour. 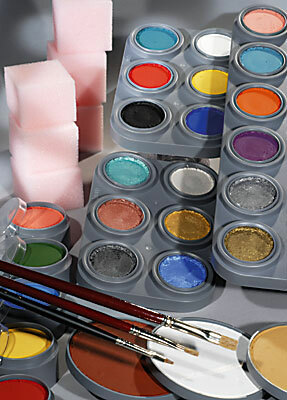 Read more >> X When working with Water Make-up preferably use separate brushes for light and dark colours. To draw a thin line, you do not necessarily need to use a narrow brush. You can also use the edge of a flat brush for that. Draw a line down from the middle of the nose (between the nostrils) to the upper lip. This line gets wider as you get towards the upper lip and you then draw it along the upper lip to the corners of the mouth. Continue the line beyond the corners of the mouth and upwards in a curved shape. Read more >> X If you do not want the colours to mix, be sure to wait for the first layer to dry before applying another colour over it or up against it. You can also use Grimas Stipple applicator for this. Hint: Regularly change the water you rinse your brushes in and preferably work with two water bowls: one for light and one for dark shades. Read more >> X Grimas Water Make-Up (Pure) can be used around the eyes, but children often do not like it when brushes are so close to the eyes. So decide yourself how far you want to extend the colour. 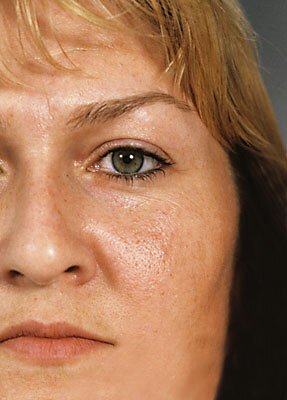 When working under the eyes, have your model look upwards - only with the eyes, without moving the head. If you work above the eyes (eyelid), have your model close his/her eyes in a relaxed manner. Children are inclined to shut their eyes tight. Then you can say: keep your eyes closed as if you are sleeping. To make the eyes appear slanted, you proceed as follows: Draw with a fine brush to draw a black line along the upper edge of the eyelashes. Then extend that line diagonally upwards from the outer corner of the eye. Then extend it the other way, from the inner corner of the eye downwards. Read more >> X Draw the areas in with a flat brush. 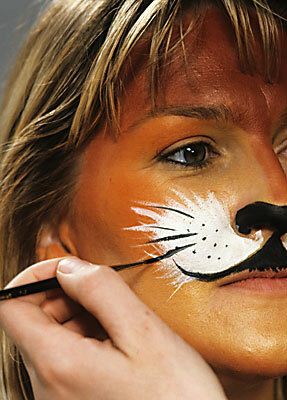 Start at the bridge of the nose with the side of the brush and paint the larger areas using the flat side. Read more >> X General tip: Water Make-up can be used to add (additional) colour to the hair and eyebrows, provided that the hair is not permed, bleached or dyed. Use a toothbrush to do this. 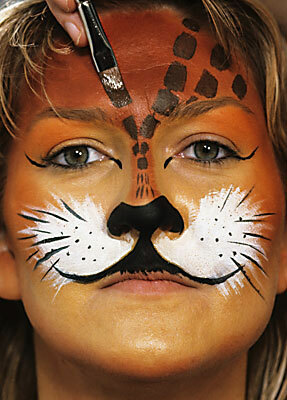 You can paint the lips with Water Make-up (Pure), or alternatively you can use Grimas Lipstick (Pure). 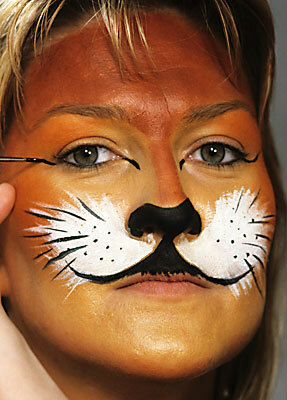 Use the same shades to draw small stripes in around the chin. Do not use Afschmink, as this contains waxes and oils which actually adhere the Water Make-up to the skin. Do not use ready-to-use cleansing cloths. 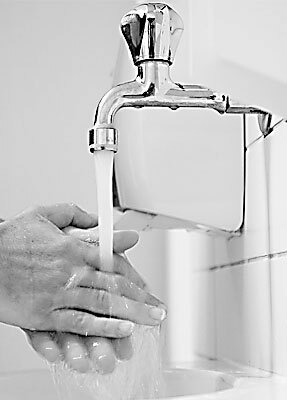 Read more >> X If Water Make-up gets onto clothing, rinse it out under a tap. Leave the item of clothing to soak in water containing a pre-wash (Biotex). 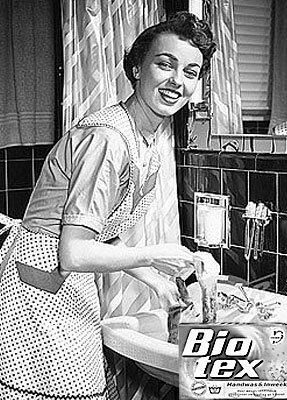 Then wash it by hand or put it in the washing machine.